Aspen Ridge fifth-grader Kendra Scherer tries to determine the height of a tree by gazing through a clinometer, while classmate Athena Kinnunen follows the line of sight. Students Madelyn Reader, Ella Brand and Catherine Bartanen are also pictured, from left. Wheels to the Woods helped fund transportation for the Forestry Field Day outing. Photo by Michigan Department of Natural Resources. Connecting children to wildlife and other natural resources can be one of the most exciting, rewarding and fulfilling endeavors for educators and students. With another school year beginning, some people may not know the Michigan Department of Natural Resources provides numerous opportunities to help teachers make those valuable connections between the state’s natural and cultural resources and students of all ages. Through the Go Wild for Michigan’s Wildlife curriculum, elementary school educators can introduce young learners to Michigan’s wildlife species and their habitats. Critter cards, featuring 19 different Michigan wildlife species, are included with the Go Wild for Michigan’s Wildlife curriculum. The facing card shows a painted turtle, Michigan’s state reptile. Photo by Michigan Department of Natural Resources. 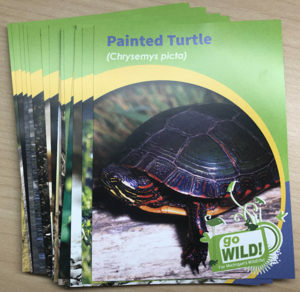 Included with the lesson plans and activities, are “critter cards,” featuring 19 different Michigan wildlife species. While each educator receives a PDF version of the cards, the DNR also prints a limited supply of the cards, so students can have a set to keep. The available card sets are distributed to Michigan teachers on a first-come, first-served basis. “Throughout many lessons, I would hear, ‘I’ve seen that animal before’ or ‘I’m going to look for that animal tonight when I get home,’” Simpson said. During the 2017-2018 school year, over 800 kindergarten through fifth-grade educators registered to receive this free curriculum. Using actual location data from radio-collared Michigan black bears, middle school students can find out what bears are up to throughout the year. A Year in the Life of a Michigan Black Bear provides lessons, videos, activities and bear location data to help students learn more about bear behaviors and habits at various times of the year. Like other DNR wildlife classroom curricula, this program is offered free of charge. Educator Brandy Dixon, from Holy Ghost Lutheran School in Monroe, said she uses the curriculum in her classroom and she loves the program. With knowledge and experience comes greater understanding. Classes that participate in the curriculum also have the option to enter a Year in the Life of a Michigan Black Bear contest. After learning all about black bears in Michigan, students can create a way to share the story of a black bear’s journey throughout the year. Educators representing the top three projects are awarded gift certificates to purchase science supplies for their classroom. Prizes for the contest are provided by the Michigan Bear Hunters Association and the DNR. The DNR also offers middle-schoolers curriculum centering on wetlands and some of the birds that live there. Michigan’s Wondrous Wetlands and Waterfowl offers an opportunity to learn about the ducks, geese, and swans found in Michigan, as well as the critical importance of wetland habitats. Lessons include several activities. Students can become a bird in a migration simulation that illustrates the perils that waterfowl encounter during their bi-annual flights. Students also will engage in land-use planning, and analyze Michigan waterfowl population data. 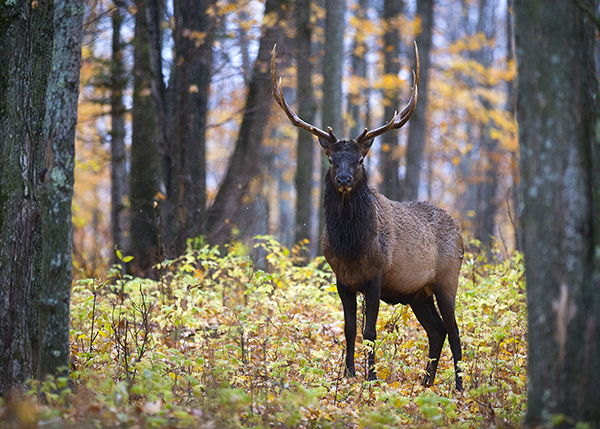 A Michigan elk is shown. Photo by Michigan Department of Natural Resources. Michigan once had elk across the state, but by the late 1800s, all the native elk had disappeared due to unregulated hunting and drastic landscape changes that led to a lack of habitat. In 1918, seven elk were brought from the western United States to Wolverine, Michigan to re-establish our state’s elk population. Now, 100 years later, Michigan has a healthy and abundant elk population resulting from intentional land management and increased law enforcement. Students can learn more about this conservation success story and celebrate elk in the classroom with Elk University. “This educational program gives high school students to chance to step into the role of a wildlife manager,” said Katie Keen, DNR wildlife communications coordinator. Students will learn about elk, their habitat needs, Michigan history, wildlife disease and forest management. They also will explore social considerations for wildlife management. Elk University is offered free of charge to ninth through 12th-grade educators. 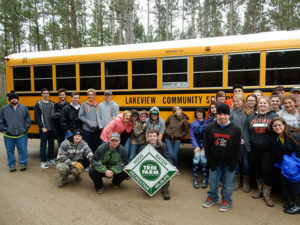 Lakeview: Students from Lakeview Community Schools pose for a photo after visiting their school forest. 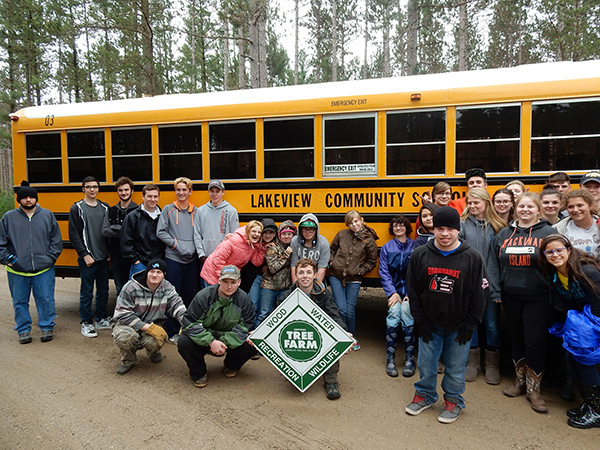 Wheels to Woods provides field-trip funding to forests for pre-K through 12th-grade schools in Michigan. Photo by Michigan Department of Natural Resources. 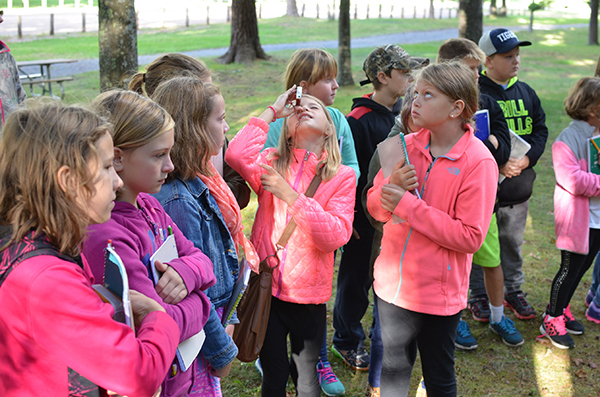 “Forests are critical habitat for many species, such as bear and elk, and a field trip is a great way to have students experience these resources first-hand after learning about them in class,” Keen said. Any pre-kindergarten through 12th-grade school in Michigan is eligible to apply for funds to go on a field trip to a school forest, private forest, public forest or forest products company. For more information and an application form, visit treefarmsystem.org/wheels-to-woods. Applications are accepted throughout the year. If a field trip is not feasible, educators can incorporate trees, forests and more into the classroom with Project Learning Tree. With this award-winning outdoor curriculum that meets both state and national standards, educators can find lessons and activities for learners of all ages to incorporate into classrooms and other educational settings. Learn more about Michigan Project Learning Tree at www.michiganplt.org. Project WILD workshops offer professional development for bringing hands-on natural resources-related activities to classrooms. Several Project WILD guide books for kindergarten through grade 12 are available. Find out more at michigan.gov/michiganprojectwild. Get salmon in the classroom. Caring for young salmon encourages third- through 12th-grade students to think and care about conservation and creates a connection between caring for their fish and caring for their local environment. Learn more about the Salmon in the Classroom program at michigan.gov/sic. The DNR’s Academy of Natural Resources, a week-long program offered in two locations during the summer months, gives teachers the opportunity to learn about Michigan’s diverse natural resources and how to bring that knowledge to the classroom. Learn more at michigan.gov/anr. To register for wildlife classroom curricula and learn about additional opportunities the DNR has to offer educators, visit michigan.gov/dnreducation. To get the latest education updates from the DNR, sign up for DNR emails at michigan.gov/dnr and choose “Education and Outreach” to subscribe to the Essential Educator newsletter. The Michigan DNR offers numerous opportunities for the state’s schoolchildren to learn about wildlife and natural resources in closer, more involved and more in-depth ways. These opportunities offered for today’s youth may cultivate a bumper crop of wildlife and natural resources stewards for tomorrow. That’s what the DNR is aiming for. 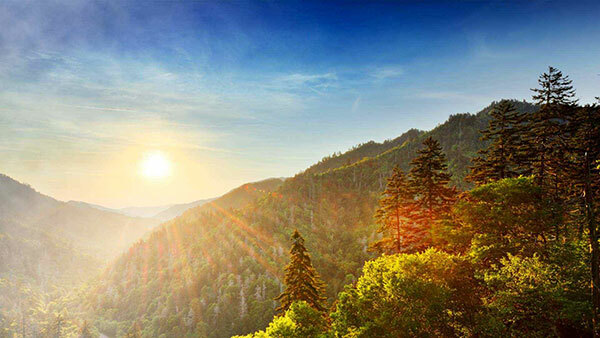 Forests across America are a prized natural resource, and anyone can help plant trees in these vital areas by joining the Arbor Day Foundation this month. Through the Replanting Our National Forests campaign, the Arbor Day Foundation will honor each new member who joins in July by planting 10 trees in forests that have been devastated by wildfires, insects, and disease. The cost for joining the Arbor Day Foundation is a $10 donation. America’s national forests face enormous challenges, including unprecedented wildfires that have left a backlog of more than 1 million acres in need of replanting. The Foundation has worked with the United States Forest Service for more than 25 years to plant trees in high-need forests. Our national forests provide habitat for wildlife, keep the air clean, and help ensure safe drinking water for more than 180 million Americans.